Have you ever wondered why the week has 7 days in it? It is so entrenched around the world even in areas not influenced by Bible teaching and yet no one really questions why this is. 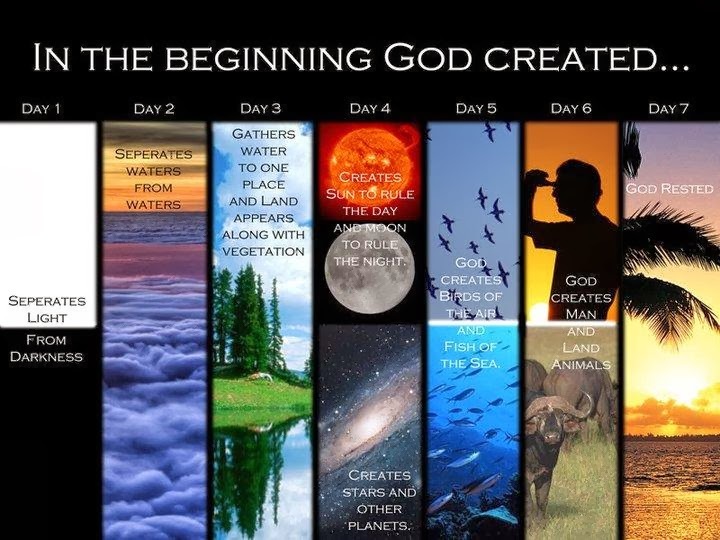 Whilst human devised methods of marking years or lunar months make sense, the division of days into weeks is much less obvious and aside from the Biblical explanation, makes little sense. 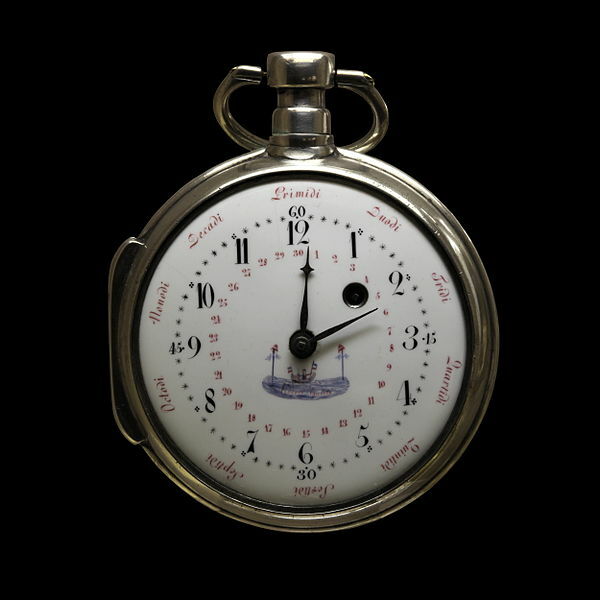 Napoleon certainly didn’t think so, the driving force behind metrification for a short time had 10 day weeks and 10 hour days! I always thought it funny actually that France is so enamoured with the metric system given that the country is well known for finding value in things other than science and efficiency such as love, literature and long lunches. Yes it might be easier to have a metric system but it rather takes away the fun and quirkiness of life. The Aztecs were one of the few others who differed from the 7 day norm by having 13 day weeks called Trecana. The reason we have a 7 day week most likely goes back to the Babylonians well before the Ancient Greeks and Romans in Mesoptamia which if my memory of what limited Greek I know is correct means ‘Land between two rivers’ or Iraq as it is today. The ancient Babylonians had a very advanced society including religion and the sciences. After the Israelites were taken away to Babylon it’s likely the Babylonians influenced the Jewish religion on a number of things such as The Great Flood with Noah bearing great similarities with parts of the Epic of Gilgamesh. Another possible influence is the concept of 7 days in week. Babylonians found 7 to be a magical or indeed lucky number and to them this important number matched up with the major heavenly bodies they could easily see in the sky, namely the Sun, Mercury, Venus, the Moon, Mars, Jupiter and Saturn. Like many other ideas in life, the 7 day week really became popular with the Romans. The Roman Emperor and Christian convert Constantine The Great formalised the centuries old idea in 321AD and determined that Sunday would be the first day of the week and the Jewish sabbath on Saturday would be the final day of the week though obviously different religions could easily adopt their own take on things! The Romans decided to name their days after the Roman pagan gods and this tradition influenced most of the world and even in distant places such as Thailand and Japan, there seem to be some striking similarities. Our modern era day names are all based on old English words and religion that was heavily influenced by the Nordic and Germanic cultures whose gods were in turn heavily influenced by the Romans. So Monday is quite easily identifiable as being the day of the Moon God or Mōnandæg as it was. The Moon god was the brother of the Sun goddess. The Latin for Moon is Lunae from which we get moon related words such as lunar and lunatic . Interestingly the Roman goddess of the moon was Diana and amongst her attributes was the ability to talk to and control animals, which rather relates to how the Full Moon is known to influence animals and even some people today. Tuesday was originally known as Tīwesdæg and is so named after the Norse god of war, Týr. You might have second guessed that the Latin word for Tuesday is dies Martis and named after the Roman god of war, Mars. Humpday is what we would call the next day of the week where I worked. As in a humpbacked bridge, once past Wednesday lunch time, it was downhill and easy going all the way to the weekend. That was the theory anyway. Wednesday is derived from the old English Wōdnesdæg so named in honour of Woden, the Anglicised version of the Norse god Odin. He was the most powerful god and father to Týr amongst others. The Latin for Wednesday is dies Mercurii which comes from the Roman messenger god Mercury. The name is still very obvious in the French word for Wednesday, Mercredi whilst because Germany fell under the influence of Christianity at the crucial time, it rejected any link to paganism and simply opted for the word Mittwoch or midweek. Of all the days of the week, Thursday most clearly keeps it links with an old god. Þūnresdæg or Thunor was the old English word for the Norse got Thor who ruled the skies with his iron gloves, hammer and magic belt. The Latin word for Thursday is dies Iovis but as in some languages such as Greek the ‘I’ in English being a “J” makes it a bit clearer to see that this the Roman god Jupiter which itself is based on the Greek demi-god Hercules. Whereas some parts of Europe later renamed or even renumbered Thursday to something a little less pagan, English speakers particularly after 1066 became less influenced by Europe and so kept the splendid named god Thor in place long after his religion had vanished. 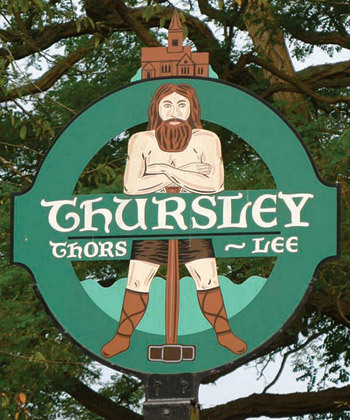 The English village of Thursley named after the Norse god Thor. The last day of the working week is Friday or Frīgedæg as we used to call it 1500 years ago. Named after Frigg who was the wife of Odin. Frigg was associated with love, beauty and fertility amongst other things and as such it shouldn’t be a surprise that Frigg was a Norse interpretation of the Roman god Venus which gave us the Latin name dies Veneris and indeed Vendredi in French. Saturday or Sæturnesdæg as it originally was known is of interest for several reasons as it is directly linked to the Latin name of dies Saturni based on the Roman god Saturn. It is the only day of the week still named after a Roman god in the English language. Interestingly linguists have managed to use this word to determine that the concept of a 7 day week arrived in England from around 597 AD. In southern Europe poor Saturn lost his day name and was often replaced with more Christian friendly names such as the Spanish word Sabado which originates from the word for Sabbath which is the same as the Jewish word for Saturday. In fact the Arabic Yaum as-sabt also involved the day of rest. Intriguingly in Denmark the word for Saturday, Lørdag, is not derived from any god or powerful figure but is simply the term for bath day or wash day. Whereas in many Christian languages the word for Sunday was changed to reflect the then new faith as was the case in places such as Italy or Russia, in English we kept Sunnandæg which relates in Latin to dies Solis or the Roman Sun god. This entry was posted in history, Life and tagged Babylon, Culture, Days, Days of the week, English, history, Life, Norse, religion, Romans, Thor. Bookmark the permalink. Reblogged this on The Beauty of My Life. Interesting post. I just returned from Rome, and I have taught both ancient and medieval Roman history. I used to teach Roman mythology. I know the Crazy Bag Lady and Chris the Reading Ape. We met on his site. Thank you for liking my post about how Pinterest can help authors. Nice to meet you. Hi Janice, thanks for tracking me down 🙂 It sounds like your classes would have been right up my street. I enjoy both their blogs and so will be checking out yours too. It is a small world and I really enjoyed your post. Nice to meet you too! I will look forward to that. I have many more Pinterest and other social media articles at my site. I would appreciate having your readership. I just read your nice comments over at Chris’s site. I returned to tell you that I considered being a travel blogger. I have been to the Meditteranean region several times. I just returned from my second trip there and the British Isles as well. Nice to meet you. Hi again Janice, I’ve not really been to the Mediterranean area as much as I should have. I’ve been to Malta and Gibraltar but mostly to areas around North Africa. I will get round to it eventually! I like travel and travel writing on my blog and the travelogue I wrote as well as working with my tours in London and around England. I have been to Egypt, and actually I have been inside a real Egyptian pyramid. Someone actually retained me to be a ghost writer on a travel blog, but it never came to fruition. Yes the pyramids are interesting places. Some of the very touristy ones are very busy and cramped. I remember one time visiting the Red Pyramid near Saqqara and the only way in was climbing backwards down a very narrow and steep staircase and if anyone came up then somehow you had to have them climb under or over you. Some of the smaller ones in the middle of nowhere can be home to nasty snakes and cobras which being English I just don’t appreciate!! Perhaps if you write a few travel articles on your blog it might help you get a travel writing position. Most of my freelance work has been as a direct result of writing on my blog rather than approaching or applying for roles.